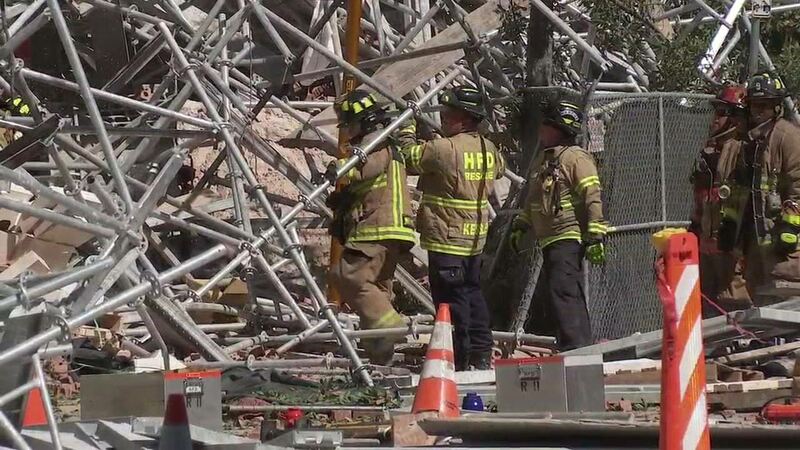 HOUSTON (KTRK) -- The scaffolding collapse on Friday left six people hurt and a tangled mess of metal, wood, stone and bricks in front of the partially built apartment building in downtown Houston. Three days later, the site is cleared. We saw construction workers back at it on the project Monday and some of the team taking apart the remaining scaffolding. The Occupational Safety & Health Administration, OSHA, is investigating the accident. In a statement Monday, the agency told Eyewitness News, "Scaffolding hazards can be attributed to a number of incidents including the planking or support giving way, or to the employee slipping or being struck by a falling object. All of these incidents can be controlled by compliance with OSHA standards." OSHA won't release any information about its investigation yet, but we've learned from a source familiar with its process that investigators have or will request all surveillance video from the surrounding area, including that from the cameras at Minute Maid Park. And that Finger Construction, the primary contractor, can erect new scaffolding at any time without permission from OSHA. Robert Wicker walks by the site every day. What happened Friday is unnerving. "Seeing it collapse, a tidal wave went down," he said. "Definitely makes you think twice. Luckily I stay away from it. I'm over here and over there I cross over. Definitely, it's been put up and you think it's going to stay there. To see it come down is kinda crazy. " He and others say it's especially worrisome given the number of other scaffolds populating the outside of construction sites in downtown with the knowledge that neither the city or the feds inspect scaffolding as it goes up. We checked OSHA's records for the last decade and found the two companies involved -- Finger and Triple S Masonry -- each have a single inspection blemish. Finger in December 2012 had two serious violations related to Fall protection; they've settled and closed the case. Triple S has an open case from November 2011 in which it was cited three times, including general violations and those related to medical and first aid.